This one day tour will bring you around the most landlocked County in Ireland and the County which is home to the oldest Mountain Range in Europe and once the highest, The Sliabh Blooms. 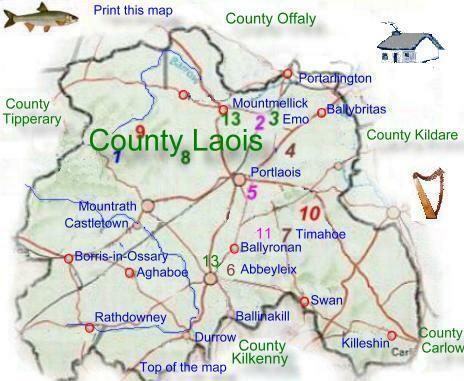 Laois is an old Gaelic County, with rich fertile lands. Laois has alot of attractions to visit, from Round Towers to Castles, to Museums to Iconic battle sites of old. Laois may not be the biggest tourist destination in Ireland, however what we lack in attractions we have in the decency of its people. In fact one of the great sayings of Laois is “Bocht agus Beannacht” meaning poor and Proud. This Tour will bring you around the County and we will visit The Ridge of Cappard, Timahoe Round Tower, Emo Court House, Ballinakill Gardens, Vicarstown Canal. Donaghmore famine Museum, and the Rock of Dunamaise. The Rock of Dunamaise was part of a “Dowry” that Strongbow received upon marrying Aoife the daughter of Diarmait Mac Murchada. Portlaoise is also the home of the most secure prison in Europe. Alot to do in this tour!